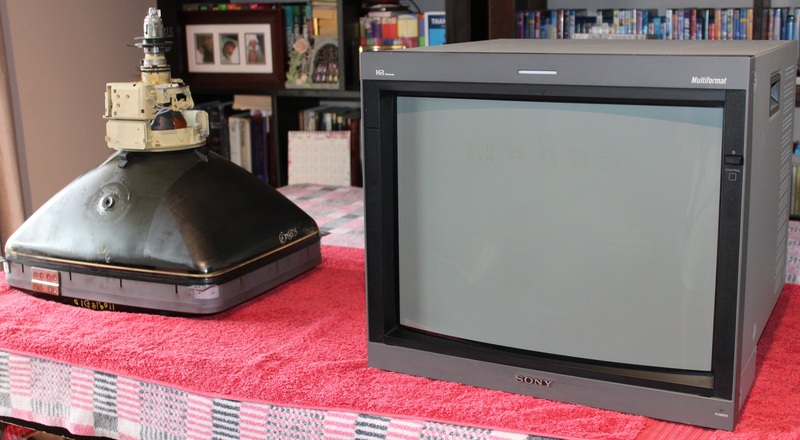 Not long ago Bob from www.retrorgb.com interviewed an old Sony tech – Savon Pat and in that interview Pat mentioned that the M4 tubes were suitable donors for some BVM and PVM monitors. It just so happened that I had access to a pretty badly beaten up and not working PVM 20M4 that I figured I would use as the donor. This monitor had some pretty bad scratches on it, it had apparently been used as a movie prop by the ABC before a guy sold them for parts on Facebook marketplace. I picked it up for $20. I didn’t get any pictures of us removing the tube from the M4 but one thing that did catch me out was that on the M4 the bolts mounting the tube are facing the back meaning that you need to remove the chassis and the metal assembly that houses the degaussing coil to get the tube out. It’s a pretty big job but I didn’t really take a lot of care as the remains of that M4 will be saved for parts and I had no intentions of reassembling it. We checked the part numbers on the tubes to confirm that they are indeed the same model. Looked good so we decided to go ahead with it, obviously there’s a bit of a risk here in that I had never seen the donor tube in action, I didn’t even know that it was functional. It could have been dropped, damaged or used so much that it simply doesn’t look good any more. I figured the chance at a functional L5 was worth the risk of wasting some time attempting this and besides that I was curious to see if I could actually pull off a repair like this – the stakes were pretty low as I hadn’t really invested much money into this project. 1, Safely discharge the flyback and disconnect the anode cap. I use a big screwdriver with a wire attached to the metal of the chassis. There are a lot of guides on the internet explaining how to do this. Don’t kill yourself! 2, Disconnect the neckboard and any wiring attached to the yoke. 3, Remove the four little screws on the bezel unscrew those and there are some wiring looms on the top with plugs that disconnect, remove the bezel. Be careful not to break the power button or damage any of the little PCBs that are behind the buttons. You don’t need to force anything here. 4, Using a 10mm socket, remove the four bolts holding the tube in, it is heavy! You will need a friend to help you to carefully feed it through with the yoke and convergence rings still attached. Be very careful! 5, Put the new tube in and put it all back together. 6, I if the bezel doesn’t go in easily, adjust the position of the tube, back off the nuts and re-align it. You do not need any force to put the bezel back. Make sure you line up the little plastic arm that is used for the power button. Now I chose to swap the yoke from the M4 with the yoke from the L5 despite them looking identical, they did have different part numbers. You can keep the convergence rings though, I used a posca paint pen to mark where they were before removing them and put them back in exactly the same spot. You might have to twist the yoke a couple of times to get the picture straight once it’s been installed. I didn’t really need to do anything besides tilt the yoke level, convergence and geometry are great! So it is true, you can swap tubes between some model PVMs. 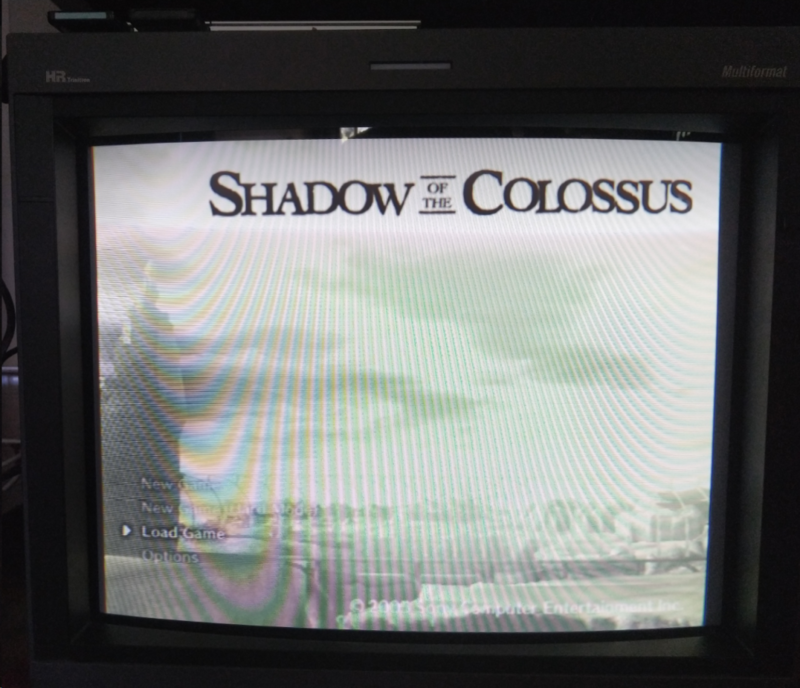 I am very happy with the result because these multiformat PVM monitors are pretty much unobtanium these days or horribly expensive. This one cost me a bit of running around and about five hours of a Saturday to perform the work. Of course it attracts a bit more glare without the anti glare coating on there and I’ll have to be very careful not to scratch the glass in future but it sure beats having a tube with burn in. UPDATE #2: Just a another word of caution – I am a qualified Electrician. I Absolutely DO NOT recommend those without formal training work on high voltage equipment! I was the friend that was there to help lift the tube in place. It was amazing to see to see him actually do this. I’m a metal working engineer by trade and I have to say this looked like some next level tradie repair job to me.